The Active Asset Allocator investment strategy is designed to deliver a consistent level of positive returns over time with a strong focus on capital preservation. I follow a multi-asset investment approach, actively allocating between global equities, bonds, precious metals, currencies and cash. I always invest with the primary trend of the market and do not follow a benchmark. Instead, I manage the market risk for clients. This strategy has returned +9% per annum net of fees since inception with a lower level of risk than the average multi-asset fund. My active asset allocation approach is best illustrated in the following chart. 2018 ended with a thud and the worst December stock market performance since 1931. Global equities corrected by -15% in three short months. Technology stocks were taken to the woodshed. Here is a snapshot of the peak-to-trough declines of some of the former leaders of this bull market: Facebook -40%, Nvidia -54%, Apple -37%, Amazon -36%, Netflix -45%, Google -24%, the list goes on. General Electric, a symbol of all that was well with the United States has collapsed by -78% and looks like it is in deep financial trouble. Meanwhile, the Active Asset Allocator has weathered the early stages of this bear market quite well, delivering a positive return of +1.0% in October, +0.3% in November and +2.2% in December. I expect this trend to continue and accelerate as the bear market progresses. It has been a challenging year and the Active Asset Allocator is off its target annual return by some distance, but when 90%+ of all markets and asset classes are showing negative returns YTD, it just isn’t possible to tack on a +7-10% annual return. However, I am pleased that the Active Asset Allocator has outperformed all other multi-asset funds on the market and at a much lower cost to the investor. Multi-asset funds of all shapes and sizes are struggling to navigate these increasingly volatile markets. Capital preservation during bear markets and capital growth during bull markets is the name of the game. I think 2019 is going to be a very good year for us and I would like to take this opportunity to thank all of you for your continued support and wish you all a very prosperous 2019. Until September, the United States had proven a safe haven for investors, with the majority of US indices and sectors sporting double-digit gains for the year. Europe and the emerging markets bore the brunt of the selling for a variety of political and currency-related reasons. However, in the final three months of the year, US equity markets hit the skids and accelerated lower. Liquidity is being withdrawn from the system in the form of quantitative tightening (QT) by the Federal Reserve and the ECB and steadily rising interest rates by the Federal Reserve. A double tightening into a slowing economy is a recipe for disaster. As long as this trend continues, stock markets will continue to fall. It is a dangerous game the central bankers are playing, but they have no other option, other than to do nothing and hope for the best. US small cap stocks have fared even worse, falling -27% from the highs of 2018. Capital tends to flow to the largest and most liquid names, where it is treated best during bear markets. Small cap stocks will be under a great deal of selling pressure over the next 2-3 years. A healthy profitable banking system is at the core of a well functioning economy. We saw what happened to the US economy in 2008 when the banks collapsed. I don’t expect a similar occurrence next time down, but the chart of the US banking sector does not inspire confidence. The KBW Bank Index plunged -32% in 2018. The Nasdaq Composite has already corrected by -24% since the end of August and this was before Apple announced to the market that it was guiding earnings estimates lower, a direct result of trade tensions between the US and China and general weakness across many of its key markets. It is the same story with the transport stocks, which have declined -26% since the 2018 Summer highs. FedEx shares have fallen -44% from their 2018 highs following a recent earnings disappointment. Turning to Europe, things don’t look much better. Economic growth is slowing meanwhile the ECB short term rates are still at -0.40%! ECB Chair Mario Draghi has stopped the printing presses just as the EU heads into its next slowdown. His term is up later this year and I would say he is thinking to himself he can’t get out soon enough. The EU looks to be in serious trouble. The EuroStoxx 600 Index broke lower out of a three year consolidation range and has fallen sharply in recent months. The plunge looks like it still has room to run. I do see one potential opportunity coming into view and that is in the UK. The FTSE 100 Index currently sports a dividend yield of almost 5%, while the dividend yield on the iShares UK Dividend UCITS ETF is now approaching 7%. GBP has also fallen over -20% versus the euro since 2015 from £0.70/€1.00 to £0.90/€1.00. GBP has already priced in a good deal of risk of a hard Brexit, which may or may not happen, but could fall further against the euro as we approach the March deadline. This could present a nice entry point for the Active Asset Allocator and I am monitoring this situation closely. Emerging Markets were hit for losses of -27% in 2018 as the break out from multi-year resistance in the 40-42 zone for EEM was unable to hold. EEM is now trading back below that breakout area again and could get caught up in further selling if European and US stock markets continue their bearish descent. A strong USD has always been a headwind for emerging markets. At some point, the Federal Reserve will stop its rate hiking cycle and the USD will top out and begin a precipitous decline. That could drive a sharp move higher in EEM but there is too much risk in that potential setup for now. So, I continue to patiently wait on the sidelines. The Active Asset Allocator’s only equity position remains in the gold mining sector, which I think has a good chance of doubling this year. 2019 could be a very difficult year for the stock market (ex-precious metals) and sidestepping major declines remains my primary focus. I do see potential opportunities in UK equities in March/April and in emerging market equities later in the year. 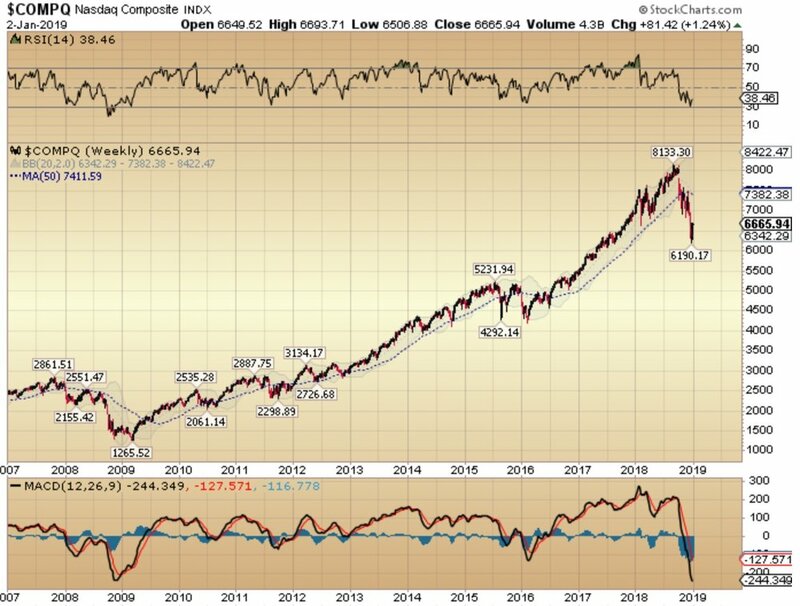 If we do get another sharp decline in the broader stock market, I will not hesitate to move back to a fully invested position (60-70% equity exposure) As always, I will be guided by my Technical Trend Indicator for potential entry/exit signals., which continues to trade in a bearish mode. There is in excess of $6.2 trillion in non-financial corporate debt outstanding in the United States today. This figure has more than doubled since the financial crisis a decade ago. Over 70% of bank loans issued by Wall Street over the last five years were ‘covenant-lite’ or had no covenant attached at all. Many of these credit instruments have been packaged into ETF’s of different varieties. Retail investors have little clue what is packaged in the ETF’s they hold. When the panic starts, many of these funds will collapse. Blackrock for example, markets a Debt Strategies Fund to investors reaching for yield, that holds all kinds of low grade debt securities. This fund has assets in excess of $600M and pays a juicy 0.80% annual management fee to the investment manager (1.85% gross expense ratio). The Fund is levered 130% and 97% of the Fund is rated BB or lower…. in short, a large pile of junk. As soon as recession fears start to take hold, this Fund is going to suffer a sharp decline. The only exposure the Active Asset Allocator had to corporate bonds was in the Blackrock EU Aggregate Bond Fund, which only held investment grade corporates, and I sold this 5% allocation in November. I do not want to hold any credit exposure as this cycle turns lower. In my last investment update, I noted that the yield curve in the US was close to inverting. Back in September, US 10-year yields were trading at 2.88%, while 2-year yields had reached 2.64%. The difference was just 24 basis points. Roll forward to the end of 2018 and the gap has narrowed further, to just 11 basis points. You will note that, while the gap continues to close, the relative strength of the decline is abating, evidenced by the RSI indicator at the top of the chart. The yield cure is getting ready to steepen again and that is when recession hits (and the Fed is forced to cut short term rates again). This is another signal that equity markets likely have more room to fall before we can get constructive on buying them again. The bond market is always considered ‘smarter’ than the stock market and has been signalling trouble for equities for a while. I was confident that stock markets were due at least a sharp correction or potentially something more severe. The new conundrum facing investors today is that there are still trillions of dollars worth of bonds trading at negative yields. This anomaly is much more difficult to decipher. Meanwhile, the Active Asset Allocator continues to hold a 20% allocation to EU Government Bonds as a defensive trade, while stock markets continue their valuation adjustment. Despite the ongoing concerns of record low bond yields in the EU and negative short-term rates, this trade continues to work well. In 2018, while global equities lost -4% for the year, EU government bonds rallied +2%. These are not big numbers but the diversification characteristics of fixed income continue to benefit the Active Asset Allocator. I keep a close eye on the performance of the iShares Euro Government Bond 10-15 Year ETF. A break out above 177 would be quite a bullish development for EU bonds. Conversely, a break below 164 would have me reassessing my allocation to IEGZ. I don’t want to overstay my welcome in this sector, but this allocation continues to work well for the strategy. After a subdued 2018, where gold ended the year +2% in euro terms, 2019 is shaping up to be much better as the gold bull market re-awakens. I believe that it is gold’s time to shine once again. Even for the non-believers, the next chart should cause you to at least consider an investment in the precious metal for the next couple of years. As regular readers will know, gold moves in cycles. Gold also often tends to trade inversely to equities - not always, but often - as it is considered a safe haven asset. It is clear from the chart below, which shows the relative performance of US equities to gold, that US equities outperformed the precious metal pretty consistently from 1990 to 2000. Then it was gold’s turn. Despite the rally in equities from 2003-2007, gold consistently beat the stock market for a decade from 2000 until 2011, when gold surged to a bull market top at $1,923/ounce. Us equities have regained the upper hand from 2011 until 2018 but it now looks to me that the trend is once again reversing in favour of the only true safe haven asset left for investors to own today. These cycles play out over years, not weeks or months. I expect this trend to reverse lower now in favour of gold over equities and think it will last at least 3-5 years. There will be peaks and troughs along the way but I expect the general direction will be higher for precious metals and lower for equities. What will drive gold higher over time? The key determinant will be the USD and I expect that we are very close to the end of the Fed tightening cycle in the US. Once Jerome Powell signals to the market that he has finished raising rates, I think the USD will be in trouble, providing a tailwind for precious metals. I also believe there are fewer real diversification hedges that remain outside of gold and this will drive additional demand for gold over time. The next leg of the gold bull market has begun and it should be a sight to behold.